Ingredients: Golden cane sugar*, cocoa powder*, cinnamon*, ginger*, chili, vanilla powder. *FAIRTRADE CERTIFIED. May contain traces of soy, egg, wheat and dairy products. Did not taste the chili at all, tasted mainly of powdered ginger, not overpowering though, so if gingery cocoa is your thing then this is for you. Me on the other hand, I was expecting a nice kick from the chili and to taste the vanilla but nothing. Whenever I have this incredibly, scrumptious fragrant, delectable, drink, I must sound like I'm really enjoying myself because anyone who's around me says...." yes yes yes! I'll have what she's having". It's a little sweet a little spicy, and you'll definitely taste some heat, but after all, spicy was the original way Aztecs drank "chocolatl". 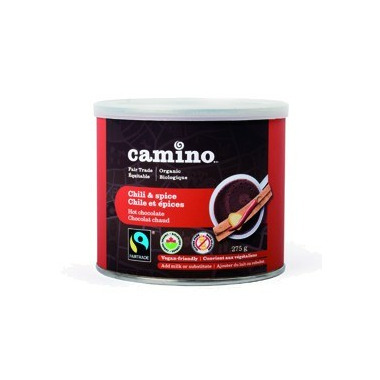 This is my absolute favourite hot chocolate by Camino! I love all of their products and this one is a fantastic treat to have on a cold, winter day. It really does have a spicy kick to it but it warms you right up! So delicious!!!! The spice is really nice change from traditional hot chocolate. Try making it with chocolate milk if you want the chocolate flavor to come out more. I love the spice, but I was hoping it would be more chocolatey. This is a truly yummy hot chocolate. The chili and ginger add a lovely rich heat and flavour, but the result isn't overly spicy. Bought it for the first time here on Well.ca as it's not available locally and I'll definitely buy it again when it runs out! I love all Camino products. I was not the biggest fan of the flavour of this product. I bought it for my boyfriend and he would rather stick with the normal hot chocolate taste. I didn't know what to expect at all with this hot chocolate. Really loved it. The spice wasn't too overpowering--just like a nice subtle heat/kick to it. This is one of our fave hot chocolates! It's amazing, hot and spicy - a sinfully delicious treat! The only disadvantage is the small container, it doesn't seem to last very long in our household, we love it that much. I LOVE this stuff. Just spicy enough, flavorful, and chocolate! What a combo! I have made it with soy milk, almond milk, regular milk and now currently use half water half 'milk' and it is still good. Only thing is I think the caffeine in the cocoa might be making it hard for me to sleep, so I have stopped having it at night...which is when I usually want it! I can't get enough of this stuff, and have already re-ordered it. It's smooth, creamy, and especially delicious when made with vanilla soy milk. The chili kick is perfect. This is the best hot chocolate ever!!!! Good on a cold snowy night and ever better if you have a sore throat....the spices make it delicious. This hot chocolate is well worth the money. It has just the right amount of spice, and is delicious mixed with some soy milk. Fabulous! This is the best hot chocolate I've ever tasted! LOVE it! I often buy two since it disappears so quickly. I also love the fact that it's organic & a Fairtrade product. This would be a great stocking stuffer. Nice kick - warms you right up! Love the fair trade... love that it is not your average hot chocolate. When you're looking for a different, delicious taste - great with rice milk! A little goes a long way - lasts a long time! Very comforting taste. So good with my favorite vanilla soy milk! Spicy and yummy ! For those bone chilling nights this winter, this will heat you up. A chocolately treat from the heavens! Nothing like a spicy hot chocolate to warm up a cool winter day!!!! I can't recommend this product enough!! Love it!! Spicy & Sweet at the same time... all kinds of yummy! I add a tbsp (or 2!) to my freshly brewed coffee and it's pure heaven!! Sooo yummy! I don't drink black tea and this is the perfect afternoon pick-me up. I like it "espresso style": a little cup, half cow's milk and half rice or almond milk and heaping tablespoon of Cocoa Camino Spicy Hot Chocolate. Microwave for one minute, stir, microwave for another minute. Presto! Rich with just the right amount of kick.